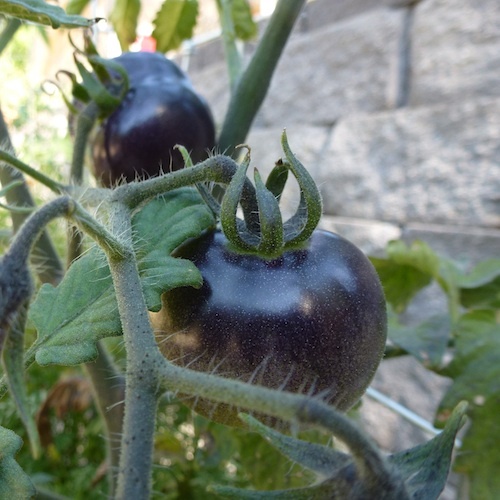 My Garden Post – I’m growing a whole vegetable garden on the deck in just 4 square feet. That’s 2′ x 2′. Get Your Own My Garden Post! You can buy My Garden Post from this Oh! Grow Up Blog. We both benefit. You save money and I get credit for your order. Use this code: 50offMGP at checkout to get $50 worth of savings for My Garden Post with Drip Irrigation. My Garden Post sent the original post to me free of charge so I could demonstrate how easy it is to assemble, install the irrigation, and grow lots of food in a tiny space. Never get on your knees to garden. No bending. Self watering. mixed lettuce, radish and green onions. Spring harvest. Cool season crops lettuce, spring onions, radish. Thinning and trimming lettuce kept them going and producing non bitter lettuce until mid June. Starter plants in My Garden Post. I’m growing a whole vegetable garden on the deck in just 4 square feet. That’s 2′ x 2′. I started a giant pot of herbs from seed. No sooner had the herb seedlings ememerged, than a bug began feasting on them. Usually, herbs don’t have insect problems. The grown basil plants, just 10 feet away, were not bothered. I used Insectisidal Soap and two days later, there was new growth. I lightly sprayed insecticidal soap again, just in case new eggs should hatch. Safer Soap, is a contact killer, so I lightly sprayed insecticidal soap again, just in case new eggs should hatch. I’ll keep an eye on this pot for two reasons. It’s hot hot hot and plants in containers are very vulnerable drought. And I want to keep an eye on the container to stay ahead of any reinfestation. 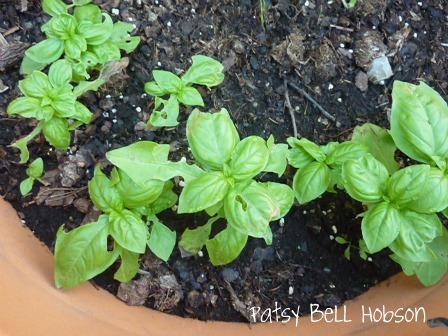 A curious note: the lemon basil growing in the sale pot, was never subjected to insect damage. Safer has a FaceBook page. 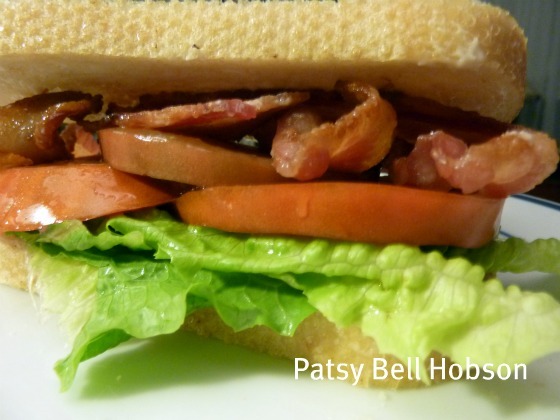 The word ‘heirloom’ harkens back to a nostalgic time—when life was sweeter, tomatoes were redder and folks actually used the word harken. Open-pollinated, or parent plants that are naturally pollinated, heirloom plants produce heirloom seed. The new generation of seeds will produce plants that are identical to its parent plants. Heirloom plants have proven to be more heat tolerant, drought tolerant, insect resistant and have more vitamins and minerals. If they didn’t have any of these desirable characteristics, we wouldn’t grow them and soon they wouldn’t exist. Mrs. Burns’ lemon basil (Ocimum basilicum citriodora ) is an heirloom (pre 1940) basil grown by Mrs. Burns in southwestern New Mexico. 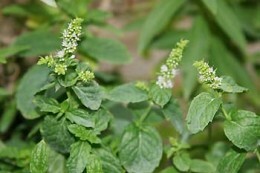 This lemon basil is taller and has larger leaves than other lemon basils. It also has an intense lemon flavor and fragrance. Patsy Bell Hobson is a garden writer and a travel writer. For her, it’s a great day when she can combine the two things she enjoys most: gardening and traveling. Visit her personal blog at and read her travel writings. In my Zone 6 garden there are always three kinds of tomatoes: a paste tomato for sauces, a cherry tomato, because these small tomatoes are always the first to ripen (and later, when the big tomatoes are producing, these small ones will be dried), and a big, meaty tomato for eating fresh (and for bragging rights). I love tomatoes and when I saw Tomatoes Garlic Basil (St. Lynn’s Press, 2010), I judged the book by its cover. It is beautiful. Eventually, I was tempted to open the paperback tribute to the garden and kitchen’s favorite produce and I’m glad that I did. The book only gets better! Tomatoes, garlic and basil are the holy trinity of the vegetable garden. Doug Oster’s Tomatoes Garlic Basil is a love letter about our favorite home garden produce. If you are one of the millions of backyard gardeners who grow tomatoes, this book is for you. Tomatoes are the star of the show. And, just like most gardens, basil and garlic have strong supporting roles in the book that magnify the magic of home grown tomatoes. The book will not overwhelm you with soil science and plant genetics. It will give you some good advice about soil preparation and plant selection. The pleasure of reading this book grows as Oster offers us many choices with these three simple garden staples. Oster is still on the big adventure of trying some different tomato plants every year as well as growing his favorites. It’s a good idea and you will never run out of tomato varieties to try. After reading this book you will be able to speak about basil and garlic as well as tomatoes with any home gardener. This book would make a great gift for either a new or experienced gardener, as well as for the recipients of your produce bounty. (I recommend you buy the print version to enjoy the artful photographs.) The only difficult part is deciding whether to put this book with my cookbooks or on the shelf with the gardening books. I decided to take the book into the kitchen and try the recipes with my own fresh tomatoes, garlic and basil. I enjoyed the humorous and serious gardening stories and there are plenty of artsy photographs throughout the book. I will definitely put Doug’s recipes and gardening tips to use this summer. Cherry tomatoes are heavy producers.